Everyone has been there where you go to a house just too scary looking and are not sure if it is best to ring the doorbell and yell “trick or treat.” If you are into that, here are some tips to making sure you have the most inviting scary home on the block. Add color: You can do this with flowers or even colored lights on your porch. Adding planters with fall flowers in it; although may seem simple, it can bring your porch to life. Light up your pathways: There is nothing scarier than not being able to see where you are walking, especially if there is a scary house at the end of it. Buy solar-powered lights to line up along your walkway for the trick or treaters. Add humor: Some people like to add graveyards with tombstones and all the fixings to their front yard. Make the tombstone names funny so visitors can laugh while also being scared. Pumpkins: Yes, pumpkins can be a little basic with fall, but it is also a nice touch. Whether you carve them up, paint them, or just leave them as is they are always fun to have. Thanksgiving is nearly the same as Halloween, just without all the scary decorations. Instead of graveyards and jack-o-lanterns, you can trade those in for some pilgrim hats, cornucopias, footballs, and turkeys. You also cannot go wrong with a nice bale of hay to add to your Holiday display. 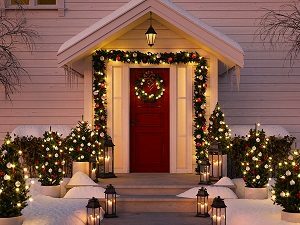 If you want to expand past your porch, you can always add light up reindeer in the yard, or if you are so inclined, blow up snowmen and Santa’s. Any bush or tree in your yard can easily transform into a Christmas tree if you add some lights to it. Something to consider if you want to utilize all the twinkly light goodness is to purchase a light timer. This will not only save you money but will also save you time, so you won’t have to replace the lights you planned to use all season long.